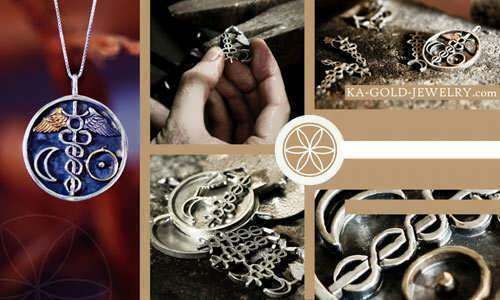 is the central symbol of alchemy." According to Burckhardt, "the two forces represented as serpents or dragons are Sulfur (sun) and Quicksilver (moon)". Sulfur is a liquid fire that fixes and coagulates, while Quicksilver is a dissolving force that blurs and adapts. The basic alchemical slogan 'solve et coagula', is the process of dissolving (moon) in order to coagulate (sun) the essential, each time refining the process more and more until it is pure spirit. In order to evolve spiritually, we need to free our self's from deep social, physical, mental and emotional programming and the physical, material attachments. For us to reach our true androgynous nature we must make changes that purify and dissolve their limitations on our experience, these limitations as are put there by social orders and herd mentality, material addictions, and basic, distractive habitual patterns. In astrology, the sun and moon are considered the two sides of everything in our earthly existence. There is nothing in this world that cannot be separated into these two principles, they constitute the most basic split of the absolute 'one' (monad) or prime energy in the hierarchy of descent into matter. These two half's are two aspects of the 'one' that become distinguishable in the physical existence and are what makes it possible in the first place. 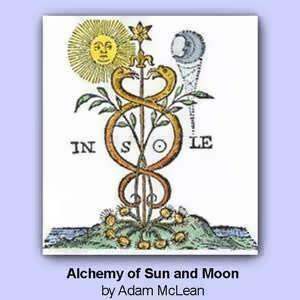 "The sun is the father and the moon is the mother "
The Marriage of Lights or the Alchemical wedding composed of the One active (sun) and the other receptive (moon), the sun and moon are the rulers of the most basic breath and rhythm of life. Exhaling and inhaling energy as reflected in the cyclic movements of every component in biological life and the vibrating fabric of all matter. The sun in astrology is the symbol of the higher self, the emanating life force and the eye of consciousness. It is the animating principle, the self-generating cause of life, movement and action, and it is the source of light which is reflected from every part of our being, just like the light of the sun is reflected from the wandering planets. It can be said that the sun is by itself a unity, and it encompasses all. But from the perspective of the earth and earthly life, it is equal in size to the moon, and the rule of the cycle of time is divided by both as expressed by the rhythm of the night and the day. As the sun is a unity, so the moon is really a projection of the feminine aspect of the sun itself, but, from the perspective of the earth, they have the same weight. Some, like the Hindu astrologers, say that the moon is more basic and individualized in our soul and personality and therefore more important to our earthly life than the sun. In our reality, they are interconnected and are dependent on one another, just as a biological organism is dependent on the life force to animate it. However, their raw expressions in our self are mostly in conflict and we find our self jumping back and forth from those contradictory needs and motivating pulses. The two lights are the two pillars of existence and are continuously aspiring and longing for the unity of the 'one' or in other words the Marriage of Lights. In the 'one' or the higher aspect of our soul, which is an expression of this prime energy, those polarities are in union and perfect balance. But in this third dimension physical reality, this balance is not achievable in its purest form; the two polarities are in a constant battle like the similar poles of a magnet overcoming one another in the sequence of time. This results in friction and strife, and a continuum of a dance of opposing forces, which we reflect in our own soul while in the body. This is the main force behind growth and evolution and this is the essence of Alchemical wedding. 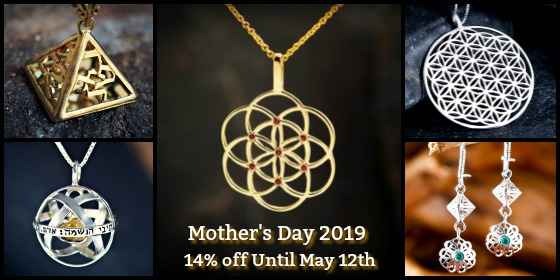 The aim of most occult and spiritual teachings, from Taoism to yoga and alchemy and many, many more is to reach the state of yin-yang balance, and in this to reflect the soul's androgynous nature while still in the body. The Alchemical wedding strives to that same balance. Real balance can only be achieved by giving each of these sides of our soul its proper place and expression of its maximized potential. Balance in this regard is not a static thing; it is not something bland that smudges the distinction. On the contrary, balance is harmonized movement of the two poles while each of them keeps its integrity. 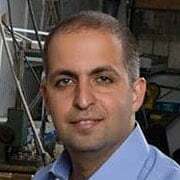 Real stability is not without movement, it is like the movement of a bicycle, the movement forward is what allows for the balance, stability is achieved through movement. We cannot only exhale or only inhale; we need to do both to maintain the cycle and regenerate energy. It is like a pipe, the only way for it to stay full is by maintaining a balanced flow. If more flow out than is received then it becomes empty. If the input is more than output, it will become blocked and unmovable. In our own soul or psyche, these two forces are mostly in a state of war. The two poles are what Jung (who has contributed to the revival of alchemy in our century) called the anima and the animus, the masculine and feminine forces of the soul. The aim of the alchemists was the transmutation of the soul; this is the "real work". 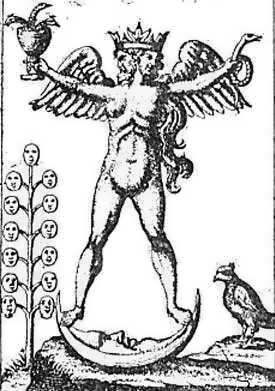 The "royal art" of alchemy, is performed through the process of the unification of opposites. The secret of the marriage is in an inner alchemical work that tries to balance all the aspects of this fundamental contrast in our being. 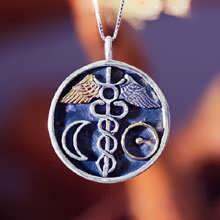 The path is through purification and unification this is done through the mind which is symbolized by Mercury as the staff of Hermes (caduceus). In the myth of the Staff of Hermes, each snake that wound itself around his magic wand conferred on him the opposing powers of "binding" and "loosening," which transmute chaos into cosmos and conflict into order. 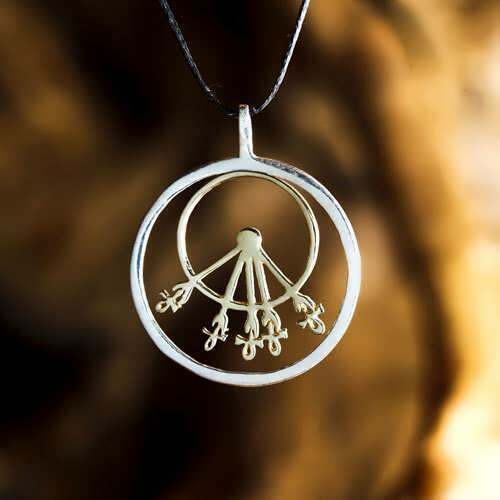 The most potent unification of sun and moon energy occurs in an eclipse (see the eclipse talisman). An eclipse was not considered a good thing in ancient times, because of its association with disasters, strong changes, and cataclysms. Eclipses are not "bad". They are shift and jolts that intensify change for "good" or "bad" depending on the maturity and perspective of the soul involved. Where an ordinary person sees a crisis, the spiritually advanced sees an opportunity. Sometimes a shock is the only way to stop, change and wake us from stagnating restrictive 'more of the same' energy patterns. This energy potential is intense, the more advanced a person is, the more true and honest he is to his path and the more willing he is to make changes. For him, this energy can be maneuvered to higher levels and greater progress. 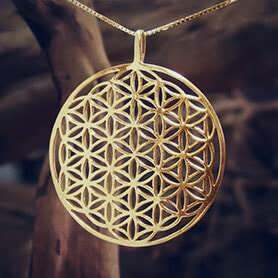 Those who are not sincere and do not feel a conscious need for growth and are unwilling to take the paths that real change dictates are not advised to wear this talisman. 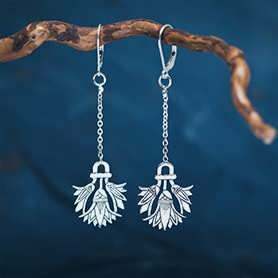 The new Marriage of the lights Talismans (also called alchemical wedding) are a combination of astrological, alchemical and magical concepts and symbolism coming from the arcane world of the ancients. 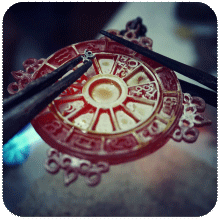 The roots of the Talismans are extensive and profound in their uses and meanings. 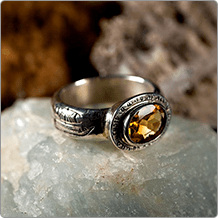 They stem from an age when the sacred and spiritual marriage of the sun and the moon was considered the symbol of the union of the most fundamental and archetypal polarities in the nature of the cosmos and the nature of the soul. 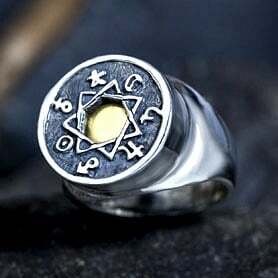 Both talismans are a combination of the metals ruled by the lights: gold symbolizes the sun; silver symbolizes the moon and their ancient astrological glyphs. 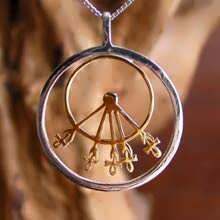 They are made ('born') during specific astrological times to draw out, intensify, reinforce and bring to life those symbols. 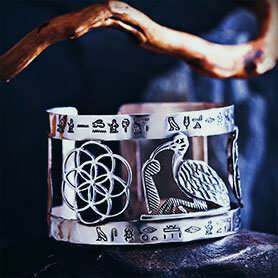 This talisman is designed to do just that, it can accelerate this process strongly; it will push us to be in sync with their polarity-uniting force which will push away the external polarizing influence. 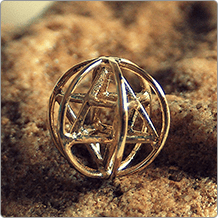 This talisman can push us to our limits in our quest for realization. It can make us face our deepest fears (eclipse - light in our dark places) and be reborn while releasing and freeing us from old, stagnant energy and patterns. The ease or difficulty can be shown by the placement of our own sun and moon in our natal chart and the phases that they make in relation to each other. An eclipse symbolizes change and transformation that can occur, in its extremes, through crises and even pain. No real healing can happen without a healing crisis, no real awakening can happen without a sincere and penetrating realization and a severe reversal of denial patterns. Real progress comes through pushing us out of our comfort zone. For something new to emerge in our life something of the old has must 'die', much as a caterpillar transforms into a butterfly.